Holywell Park is a very busy conference centre owned by Imago Venues in Loughborough, a long-standing client of Chrysalis. Having fully refurbished Imago’s 96-bedroom Link Hotel, in addition to designing and refurbishing the restaurant, bar and lounge at their flagship hotel, Burleigh Court, Chrysalis was more than happy to help this much-valued client with their next hospitality project. The conference venue is well located in Loughborough and is available for corporate events, private hire and more. The venue is ideal for business conferences, networking and training events and is subject to significant volumes of foot traffic. Therefore, the scheme needed a professional design to take into account the flexibility required of the space. Imago Venues enlisted Chrysalis to modernise and revitalize areas of Holywell Park to upkeep the quality standards that Imago Venues’ blue-chip clients demand. 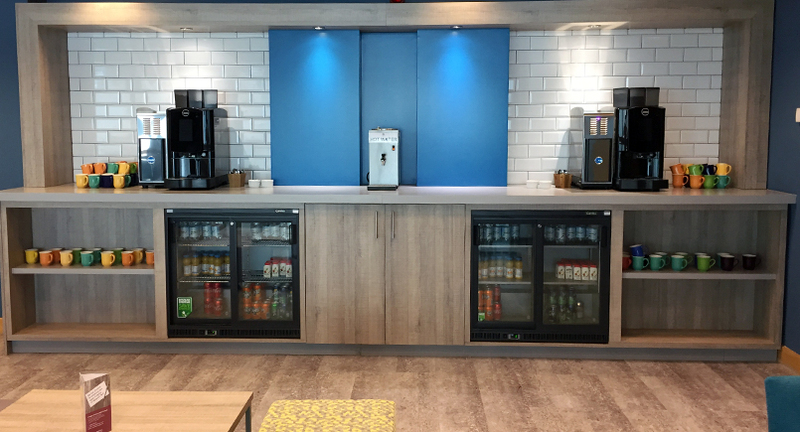 The existing breakout area had a large tea and coffee station unit in an oak finish with built-in spotlights and shelving for merchandise and crockery. 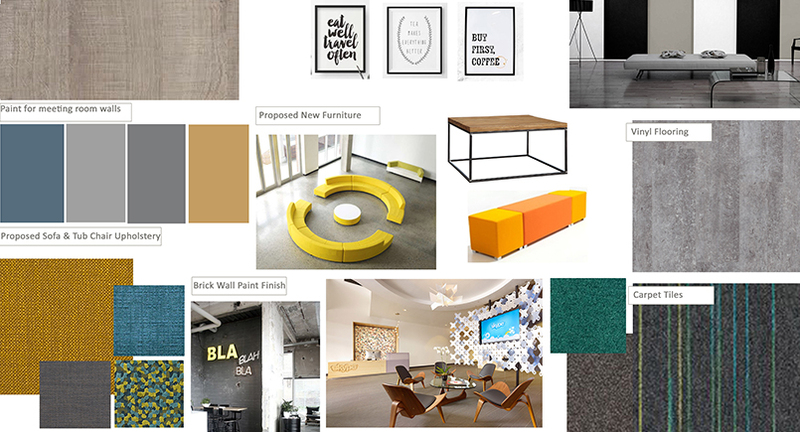 Chrysalis Senior Designer, Louise Shaw, produced a colourful and fresh interior design proposals for this project which consisted of vibrant colours and modular designs that were in keeping with the professional aesthetic of the business while not appearing too corporate and safe. The existing breakout furniture consisted of very tired, dark burgundy faux leather. 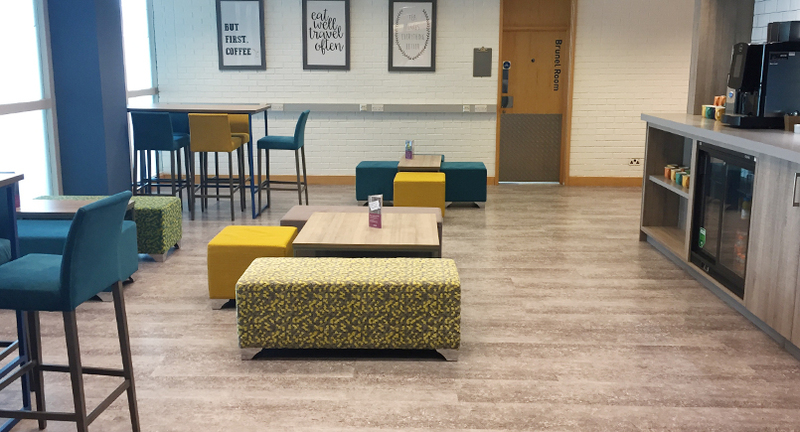 Chrysalis specified a mixture of new, modular loose seating and tables for this space, in both high and low-levels to break up the space in vibrant tones of yellow, blue and green. Other areas of the conference venue had similar coloured seating to create a harmonious theme throughout. The walls of the existing breakout area had red and beige exposed brick which had a 1980’s leisure centre aesthetic. As a result, these were painted in white to transform and brighten the area. The previous shelving was removed from the wall behind the tea and coffee making station and to complement the now white brick walls, white metro tiles were used along the back of the station. The central part of the wall which was previously purple and featured hooks for mugs was painted a sky blue to match the other walls in the breakout area. The walls we also decorated with picture frames containing bespoke monochromatic barista graphics. The station itself was redesigned with a similar layout and function, but in modern materials that worked well with the new colour scheme. The new coffee station panels were made in an authentic Grey Arizona Aak Egger Laminate. The grey oak was light enough to compliment the new design scheme and existing flooring and durable enough to withstand heat and moisture which a tea and coffee station would frequently endure. The top surface of the station was clad in a moisture resistant boarding in an Egger Stone Grey. This boarding was again used to create additional shelving on the far ends of the coffee station which increased storage space. The centre cupboard received new pull handles and the existing refrigerators either side which housed cold beverages for the conference attendees were kept. In the breakout areas amongst the loose furniture was small modular cube seating that could be reconfigured and easily moved to create small meeting spaces for visitors. The modular seating was upholstered in a mixture of Sunbury contract standard fabrics. A number of cube pieces were upholstered in Garda Harbour 8020, a blue woven fabric that complimented the blue accents on the walls. Longer modular seating pieces were upholstered in Camden Calypso, a multicoloured blue, yellow and grey small pixel pattern and Belfast Submarine a yellow fabric by Sunbury Design. The patterned fabric picked up on the accent colours that featured on the plain fabric seating and in the surrounding décor. In addition to these bright coloured fabrics, a Sunbury’s contract grey, Belfast Diesel, was used as a neutral tone within the new scheme. 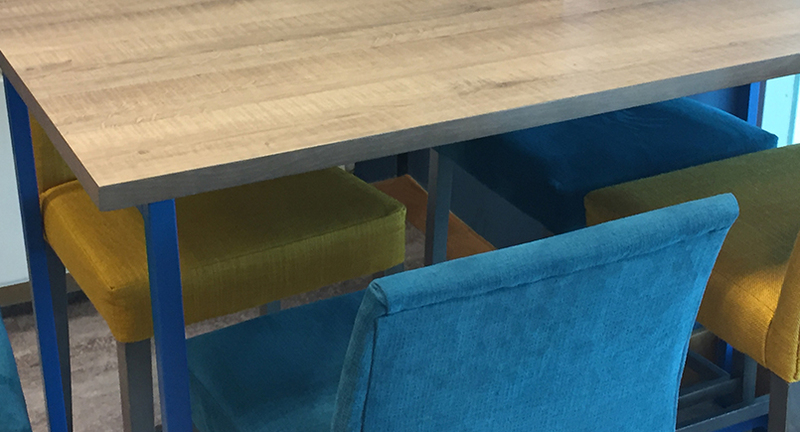 Poseur seating and metal tables were also specified throughout the breakout area and were upholstered in the yellow Sunbury Garda Harbour, a vibrant, blue and Belfast Submarine, a sunflower yellow. The conference rooms were lacking in a modern professional appearance. When Holywell Park was comparing themselves to their local competitors, the venue looked a little outdated. Senior Designer, Louise Shaw, worked with the client to suggest some soft refurbishment changes to refresh and modernise their conference rooms without having a complete refurbishment and the costs associated with it. By changing minor aspects such as flooring, lighting and the blinds, it made a vast improvement in transforming the rooms with the budget associated with the project. The same furniture was to remain in the conference rooms, but years of experience told Chrysalis a new carpet would make a considerable difference to these rooms. A forest green, the worn carpet was uplifted and replaced with a new Desso nylon carpet tile in Neo 0953. The carpet featured a subtle pattern of bright coloured lines against a dark background. These bright colours add a dimension of activity and movement to the carpet without it being too overpowering. Elements of lighting were changed throughout the many rooms as the current lighting was not the most flattering nor modern in style. Whilst replacing the ceiling tiles with new Armstrong Tatra white, the existing light fittings were changed to a smaller light that didn’t appear so clinical when used. The existing blinds were functional for the conference rooms but not the most attractive. The thin vertical panels were beige coloured and would often show dirt if not cleaned regularly. Louise specified a much larger vertical blind that meant there were fewer panels, making housekeeping easier. These blackout blinds were ideal for when presentations were taking place on an overhead projector as the larger panels and blackout material meant fewer chances for natural light to peer through. These blinds were supplied in a mixture of colours including grey, white and blue. 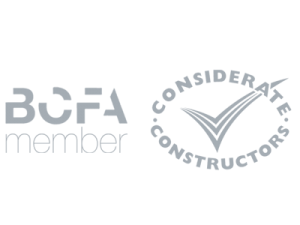 The installation of both the breakout area refurbishment and the 10 conference rooms was conducted in two phases. The conference breakout areas were first stripped of the necessary furnishings and fixtures. Chrysalis specified a loose lay vinyl that didn’t need to be adhered to the sub straight which eliminated unnecessary processes. The project was carried out over two weeks and the breakout area is now a more welcoming and up-to-date space that allows the conference centre visitors the option to work within the space should they wish to. If you have a conference centre or venue that could benefit from the design expertise of the Chrysalis team, don’t hesitate to contact us. Does your conference venue need the expertise of Chrysalis?